It has been a busy few months in the AERU department! 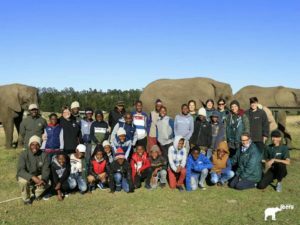 Not only research wise but we have also hosted events, made enrichment devices and followed lots of elephants during tourist walks for one of our students research projects. We’ve also had a bunch of incredibly proactive volunteers from all walks of life, and would like to say a big thank you for all the hard work that you put in over your stay – but also a big thank you for all your continued support, even after you have returned home. Keep on reading to find out details on how you can help AERU from where ever you may be. May marked a year since Amari’s herd arrived with us at KEP, so it’s time to look at how they have settled in. It was initially slow progress as they spent much of the day apart but, as we mentioned in the previous newsletter, they have started to spend more time together. This could be due to the strong relationship they have formed with Keisha. Towards the end of June, Madiwa, then Shanti and now Amari have started to join the others at the barrier on busy occasions. Sally only displaces them every now and again – when she feels that they are eating too much of her food! More frequently they are joining the others when browse is brought to the field. This encourages them to spend the majority of the day together with the rest of the elephants, integrating and developing hierarchy within the herd. 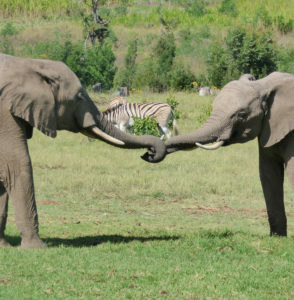 Madiwa and Mashudu have developed a very special relationship, they are often sparing with each other. Madiwa still very playful and she has quite a feisty personality never letting Mash get the upper hand. We have also started to see a change in how Shanti and Madiwa react to Sally’s displacements, now only taking a few steps away from the barrier or browse pile, moving on to another pile of browse rather than leaving the area completely. Amari sometimes strays and spends time alone, but always returns to see what everyone is getting up to. The guides continue to encourage them to find a positive space between all of them, where they are comfortable in each other’s company. We are all keeping a close eye on these exciting developments. It will certainly be interesting to see how these relationships develop. 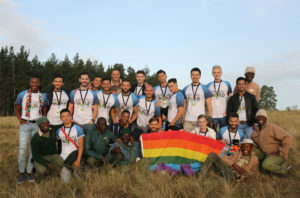 At the end of May, we had the pleasure of welcoming the delegates and press team of the Mr Gay World 2018 pageant. While they were here they were challenged to make a creative nature/animal- themed tray enrichment using pumpkin, pineapple, apples, oranges, sweet potato, pellet cake mix and popcorn. The effort put into the afternoon by the delegates was amazing and some wonderfully unique creations were crafted. After presenting their tray enrichments, and feeding them to the elephants our guests were given the chance to spend some time in the field, interacting and learning more about our gentle giants. As a thank you for the wonderful and very successful afternoon the AERU team received tickets to the grand finale of Mr Gay World 2018 in Knysna. The event was truly spectacular and the team really enjoyed it! Over the July holidays we invited 80 children from the Muddy Pooches organization to come join us and visit our elephants. Muddy Pooches is a community initiative based in Plettenberg Bay that works with children and their dogs living in the local township areas. It is run by wonderful women who help the children learn to look after their dogs by providing veterinary care, healthy food and warm kennels. This programme gives the children a good sense of responsibility by teaching big life skills. We had a wonderful time with the children and ladies from Muddy Pooches and are looking to support more projects with them in the future! Inspired by all the good that Muddy Pooches does for the community, we decided to collect scrap wood and help make some warm and waterproof dog kennels to hand over to the children and their puppies. We were lucky to receive whole stacks of offcut planks, as a generous donation from Marnie of Koffieklip Farm, with the aim of being able to make 20 kennels. The building has begun and three kennels have already been handed over to Muddy Pooches! 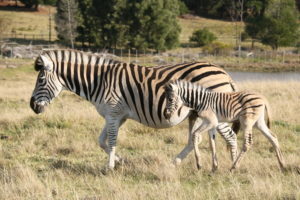 On Thursday the 19th July 2018, we were very happy to see that a new baby zebra was born! The tiny long-legged baby was seen with mother, Florence and big sister Fikile who was keeping a watchful eye over her wobbly new sibling! We would like to welcome Farai, a baby boy, whose name means “rejoice” in Shona (a local language from Zimbabwe). So far in his short life he is really living up to his name, often seen prancing around on his long legs, running and jumping through the long grass in the field. A shout-out to our resident photographer, Vuyo, who helped us choose his Farai’s name! The winter months are a time when AERU welcomes overseas students to conduct research for their university degrees! Laura Schwilp is a former AERU volunteer from Germany who is studying at the University of Veterinary Medicine in Budapest, Hungary. 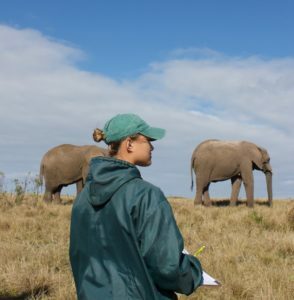 Laura’s project focused on elephant behaviours during tourist walks. This project developed after KEP took the decision to end elephant back rides; and AERU was interested to see how this translated to changes in elephant behaviour and welfare. KEP’s decision to replace rides permanently with walks was a special opportunity to see how the elephants’ behaviour changed as they got used to the new routine. 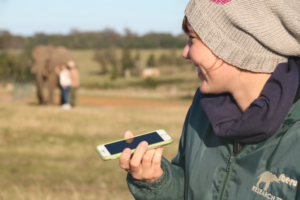 By walking alongside the elephants while they are walking with guests, and using a voice recorder to dictate even the little movements they make, Laura focused on comparing their rates of behaviour before and after rides were discontinued, paying particular attention to . Self-directed behaviours (SDBs). SDBs are movements that we believe could express uncertainty or mildly conflicting feelings; and may help us to identify particular situations that elephants view in a not-so positive light. AERU volunteers and staff were able to collect the same information at a time when rides were still conducted; providing data for Laura to compare with after the rides were replaced by walks. We hope that in the future, methods like this will mean we no longer have to assume what elephants like or don’t like when we are assessing welfare – we’ll be able to ‘ask’ elephants for their own feelings about the activities they do! 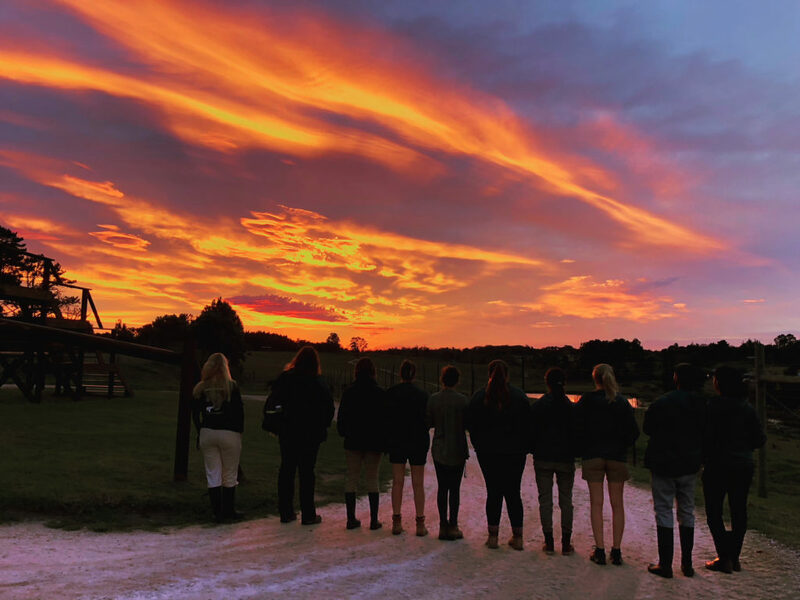 “This summer I am studying the formation of friendships between members of two unrelated captive elephant herds. 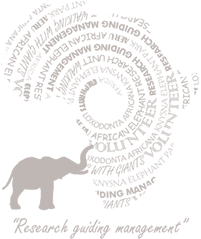 “Friendship” strength will be measured by the distance (in meters) between two subjects. I am also examining the social interactions that occur between these elephants. At the end of my project, I will see if there is a relationship between friendship strength and social interactions. For example, a question I am looking at is whether certain interaction behaviours are more likely between elephants with a stronger friendship. We hope that Olivia’s project will show us how rescued elephants form bonds with each other when they are allowed to make friends on their own terms. Results could help us understand the process by which orphaned elephants create their own new ‘family’! Finally arriving at the barrier, just in time to meet the tractor and its tourists, Shungu decided to be brave and stand in the middle – where Sally would normally be! He then spotted not one, not two or even three, but four overflowing buckets of fruit! “For me! All for me!” he thought with delight. One by one he munched and crunched his way through the buckets, starting off a little nervous but gaining confidence with each mouthful as it became clear that no one was going to join him. Once the last fruit was chewed, swallowed and savoured, Shungu spun around and took off leaving nothing but dust as a thank you to the tourists. He ran back to the others, ears out, head up, and tail straight, trumpeting a tune of smug victory, making it known to all that he, Shungu, had four buckets of fruit all to himself! 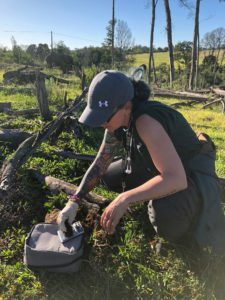 In June we were approached by our long-time AERU family member and ex-volunteer coordinator, Laurie Schelle, to assist with some Elephant Education. She had been approached by a local school to give a talk about AERU and the elephants… and they wanted to make a donation to the elephants. Could we help?? 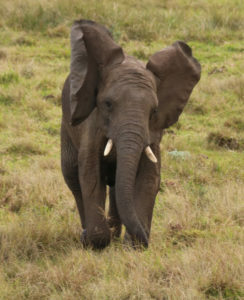 Laurie lives in Canada…how could we help educate Canadian school children about elephants?? So, we came up with the idea of using the donation money for our enrichment programme; and used the funds to purchase some new equipment and build devices for the elephants. The plan was to video how the elephants interacted with the enrichments so the children could see how their ‘donation in action’. 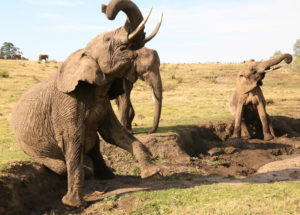 In this way, the the Grade 2 Class at St John’s School in Vancouver, could actively contribute to elephant welfare and learn more about these animals in a totally original way! We were able to make and test new enrichments prototypes which were; a popcorn blower, a rolling barrel and fruit hidey box. And finally are they safe for the elephants to use? The winning device – the rolling barrel! A barrel with holes which was filled with delicious popcorn and pellets. The aim was to roll the barrel around a horizontal central bar, and with each spin the barrel would drop treats. It took a bit of calculating, but Shanti soon figured it out and was a very happy elephant! Laurie was able to show the video to the children during her presentation, showing how Shanti tested and interacted with each device. It was a very special way of promoting elephant welfare and interacting with elephant lovers from across the globe! It’s been a busy few months in the lab since the last newsletter. We continue to focus on our “Keisha Project”. The aim of this project is to look at Keisha, a sensitive elephant, and her stereotypical behaviour patterns and try to pinpoint potential triggers of this behaviour. 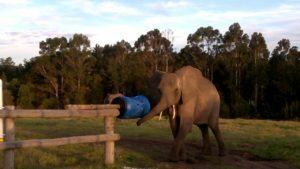 Not only will this allow AERU to identify and possibly change those factors contributing to Keisha’s behaviour, it also has wider implications for other elephants in captivity all around the world. As part of this research we will be measuring hormone levels in 257 dung samples. These dung samples were collected between April 2015 and December 2017. During this period we have also been observing Keisha’s night time behaviour looking for stereotypical behaviours such as weaving. 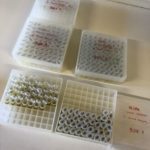 Our onsite lab has meant we are able to freeze dry all the samples and process them to the point where extractions can be made. They are now ready for hormone analysis; which is currently completed at the Endocrine Research Laboratory, at the Faculty of Veterinary Science at University of Pretoria. As you can imagine, these analyses can be a costly exercise and we have had to start sourcing funds for these tests. But, we are very fortunate to have an amazing team of volunteers, willing to work here and abroad to help our elephants!. Recently we were approached by Sara Larca, a volunteer who we had the pleasure of hosting for 4 weeks earlier this year. She would like to turn our dreams into reality, by supporting the Keisha project. She has set up a GoFundMe campaign with the aim to fundraise money for AERU. With the help of Sara and her campaign, it is our wish to upgrade Fiela’s Legacy Lab, so that we can do our own hormone level assessments and not have to outsource the testing of dung samples. If you think you can assist Sara, we invite all of you; our AERU volunteers and AERU family to join her campaign and help us reach her goal. If you are interested in contributing please follow the link below to the GoFundMe page. From all of the AERU team, we would like to thank Sara and everyone who has contributed to the campaign from the bottom of our hearts! A Big Thank You to all of you for your generous time, funds and gifts. None of this would be possible without you!